New Products + Expanded Offerings! Wire Rope Lanyards have been expanded to include stainless steel and additional lengths from stock. Many end terminal options have been added for custom landyards. Carabiners are now available from stock. Purchase bulk or with Wire Rope Lanyards/Nylon Lanyards attached for tethering. Quick-Release Detent Pins have been expanded to include both Stainless Steel and an all new ball-knob version- both available from stock. Secondary-Lock feature for Ball Lock Pins feature a spring-loaded catch in the actuator button. The catch must be depressed to actuate the button and release the balls. Key-Locking Ball Lock Pins provide additional security. Once locked with the supplied keys, the balls cannot be actuated unless unlocked. Recessed-Button Ball Lock Pins prevent accidental disengagement due to the actuator button being recessed into the cap. Quarter-Turn Pull Pins are now a part of our existing line of standard Pull Pins, also known as Retractable Spring Plungers. Stainless Steel Wire Lock Pins have been added to our stock line-up. The LOCKLESS MONSTER is an all new anti-theft cable invented, manufactured and offered for sale by Pivot Point! The revolutionary design requires no locks to use. Simply loop the cable around an item to secure from theft, and lock the ball-end into a door or trunk! It couldn’t be simpler. Uses: Tailgating, Camping, Roof Racks, Cargo Racks, Worksite Contractor Tools and MORE! 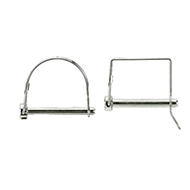 The ever-popular Bow-Tie Locking Cotter is now available in a kit! Containing sizes to fit shaft sizes from 3/16” up to 3/4”, the Bow-Tie Kit offers a wide variety of sizes for replacement of Bow-Ties found on name brand lawn equipment, or to replace those pesky hair pin cotters that keep falling out. Check out the Bow-Tie kit.